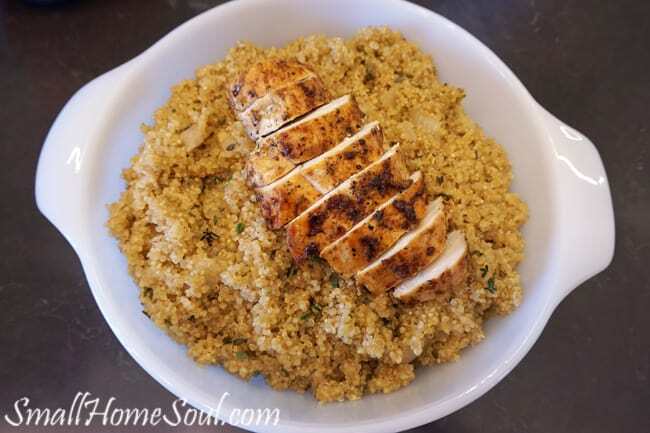 Savory Quinoa and Chicken - Girl, Just DIY! Hey friends, have you ever just thrown a dish together that turned out super tasty and then couldn’t remember exactly what you put in it? I’ve done that too many times so I started making notes on an app in my phone of the ingredients as I throw them in so I can recreate that dish later. That’s what I did for this super yummy savory quinoa and chicken. And I remembered to put it into my notes so I can make it again. This post contains some affiliate links for your convenience. You don’t pay more but I make a small commission for every purchase. 3 Chicken Breasts (optional) and more olive oil for pan frying. 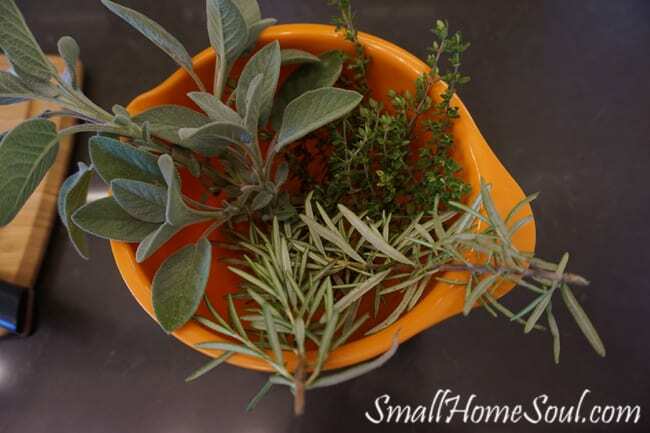 Most people think of sage, rosemary, and thyme as Thanksgiving spices but they go together nicely any time of year. 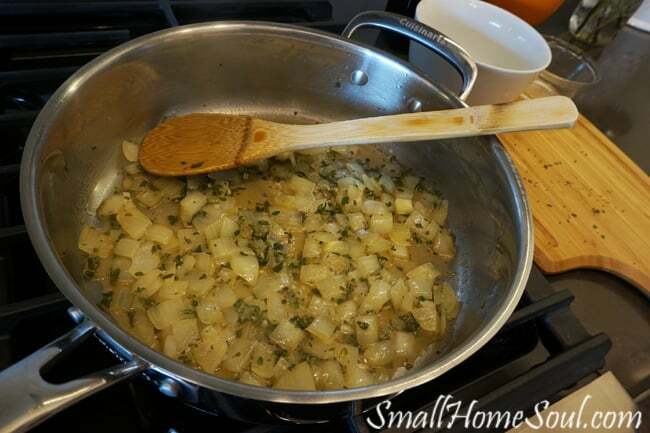 As you dice and/or mince the onion, garlic, and the herbs keep them separated. Heat the 3 Tbsp olive oil in a 12″ skillet on medium. Add the onions and saute until they start to become translucent. Add the 1/4 c of chicken stock and the garlic. The chicken stock will keep the garlic from burning and becoming bitter. Saute for a few minutes before adding the herbs. Continue to saute until yours looks like this. 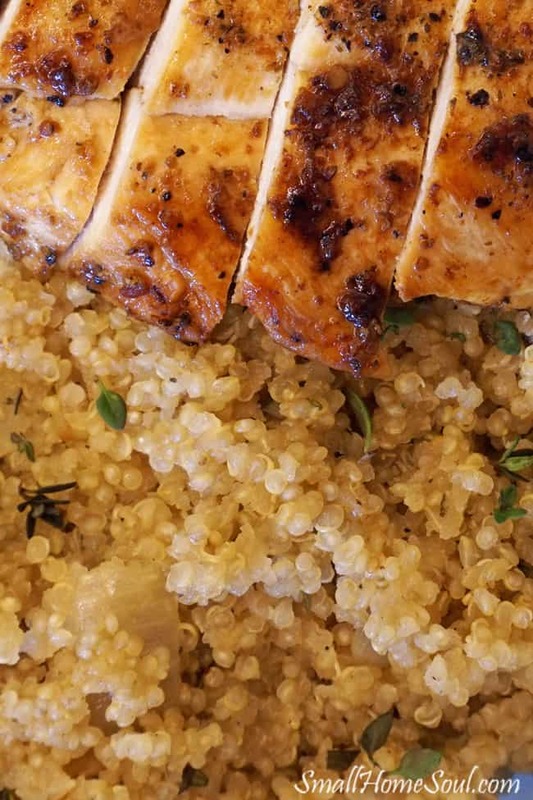 Set the pan aside and start on the Quinoa. 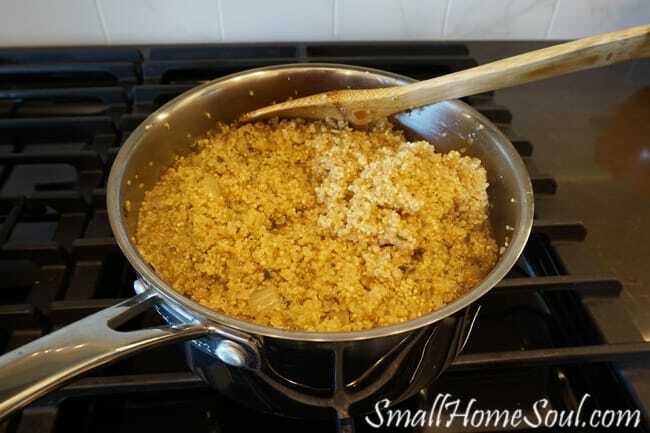 Heat the chicken stock until it comes to a boil, add the quinoa, the salt & pepper, and the herb and onion mixture to the chicken stock. Return to a boil and give it a stir before putting on the lid and reducing the heat to simmer on low for 15 minutes. 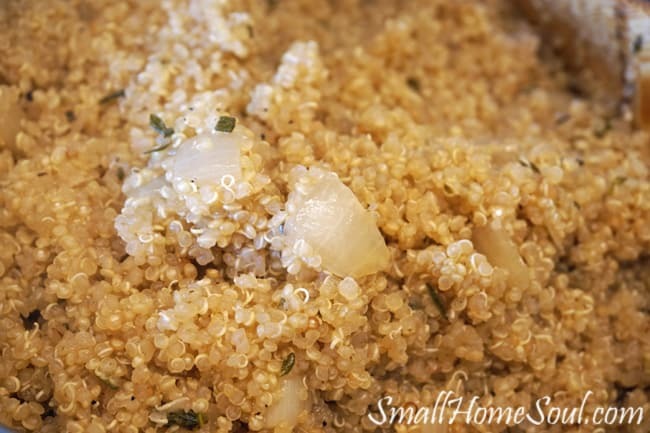 The quinoa will be done when you see the little white rings (the germ). Be careful not to overcook or it will become mushy. Remove from heat and fluff it with a fork. Return the lid and let it sit for 5 minutes. When you check it at 15 minutes if it’s still a tiny bit firm to taste and there’s a lot of liquid left leave it on the heat uncovered for a few minutes to let some evaporate as it continues to cook. 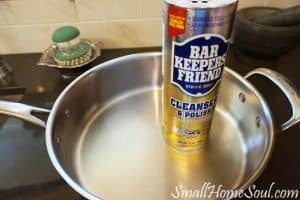 Check it often and once done remove from heat and cover for a few minutes . When you start heating the broth for the savory quinoa start cooking your chicken breasts. I like to use a complimentary spice on the chicken such as Mrs. Dash Garlic and Herb. When they’re done let them rest under tented foil for 10 minutes to retain all the juices. 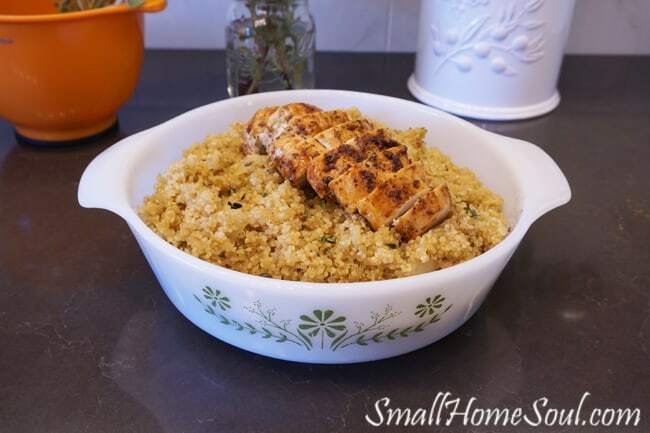 Transfer the savory quinoa to a serving dish and top with sliced chicken breast. I like to put mine into this old casserole dish that was my grandmas. An ancient dish for an ancient grain 🙂 ahh, I miss my sweet grandma. Doesn’t this just make your mouth water? 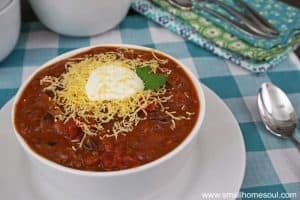 I hope you have a chance to make this dish soon, it’s even better the second day. 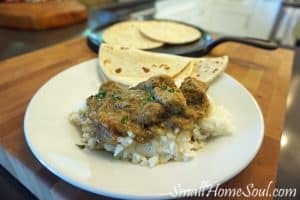 If you like this recipe you may also like my Easy Chili Verde, it’s a huge hit in my house! this looks delicious, like the perfect summer dinner! I can’t wait to try it. 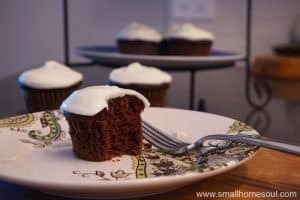 Kellie, it’s so delish, your family will love it! Sam, you are going to love this! I don’t have an iPhone so on my Samsung Galaxy I installed Color Notes. You can create a note as a checklist (for shopping) or as text. Sometimes I just use speech to text and ramble the stuff I’ve added and then go back and organize it when I’m done cooking. It looks good. I have never had quinoa, can you believe that? Debra, you have to give it a try, it’s delish! It has a slightly nutty flavor when cooked. And it’s super healthy, so that’s a nice bonus.